Michael Cheika is sticking to his all-out-attacking policy for tomorrow's series decider against Ireland in Sydney. Australia have scored five tries to Ireland's two over the 160 minutes between the teams so far, and the former Leinster coach won't change his approach for the finale. 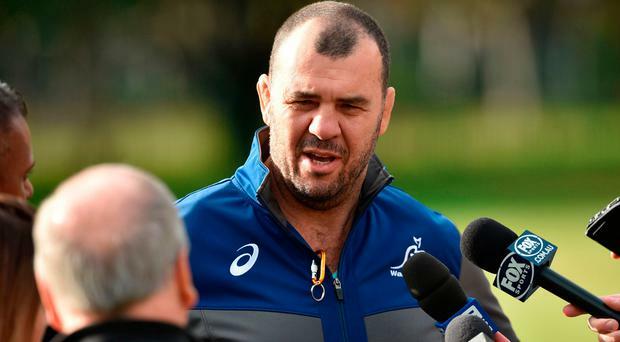 Cheika has plenty of finals experience, having guided Leinster to their first Heineken Cup and also led Australia to the 2015 World Cup showpiece, and with this series poised beautifully at 1-1, he is bringing a similar mindset to the Allianz Stadium. "I'm not used to giving my team talks out in the public domain. But rest assured they'll know exactly what's required to win this match. "It's pretty clear that there's been a very physical battle in the first two games and that will lay the foundation and the platform - like it does in all contact sports - to us being able to attack and score points, so our work ethic and physicality will be important. Nick Phipps has come into the side in place of Will Genia, who broke his arm in last week's game, while Caleb Timu loses out to Lokhan Tui who comes into the back-row, with Ned Hanigan on the bench. Their inclusion will enhance Australia's lineout after they sacrificed some height in their back-row for Timu's carrying game, but the Reds newcomer didn't have much of an impact in the first two Tests and was replaced at half-time last week. "They do that thing where they get the two players connected beforehand and they try to ram one through the other. They've been good, they're big and strong. "They've been tackling in, folding in, rolling in the way because they want to slow our ball down, so you need a physical presence to be able to do that and we've just got to get there before them. "We've got to not let them there, and if they're there we've got to get them out of the way with whatever means we need," he concluded.